Note: If C410 and C411 are ordered together, they will be shipped at a higher rate. Hood with 9 inch 5 degree windshield length snorkel features full inner bracing for light weight. Rugged enough for your racing needs. Actual scoop clearances at carburetor measures 7 1/4 inch. Scoop dimensions are 9" at scoop opening and 5 1/2 inch at rear of hood. C100 vs C190.....C190 has small metal frame built in, to support the latch in the front. Also small metal frames in rear for bolting to the hinges. 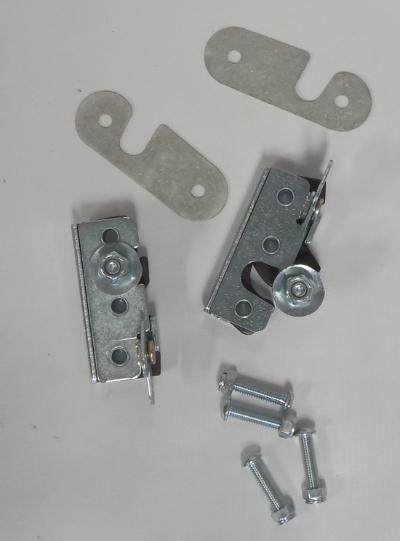 C100 has no front latch provision and cannot easily be modified for front latch, since we install the latching frame before liner is 'glassed in. 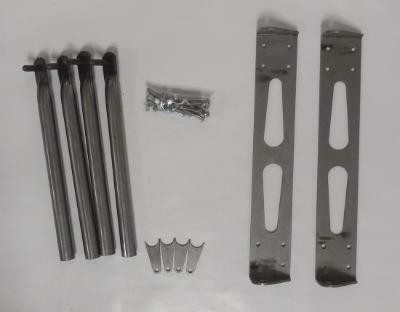 Rear hinge mounts do not have small metal frames, they consist of bonded in T nuts, good, but not as strong. Size wise...we have incorporated the proper, small, additional width to compensate for mold and part shrinkage so fit is exact. Curve to fenders is made slightly flatter so that small bumpers can be utilized to raise hood for exact fit along fenders. If it were to be made with more curve, you cannot make it fit. Liner is made as close to factory as possible, but hinge area is made different for strength. This allows rear to made same as original so it lays down flat in firewall area. Front corners are also made very slightly flatter so that you adjust them up for perfect fit. We have made so many of these over the years, we have seen all the troubles associated with this larger hood. We have "Fixed" all problems. One more thing, our low tension springs must used, DO NOT use stock springs, not even for a test fit! 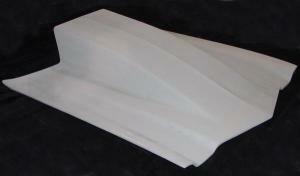 Fiberglass replica of the original GM nose. It will not crack or distort like the original. It features internal mounting flanges on each end for easy mounting to original locations. Center (bar) can also be installed. Original chrome grill filler and original grill are easily mounted. Complete with installation hardware. 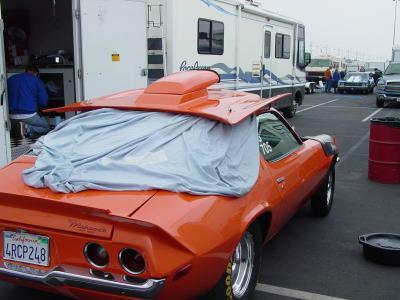 15" X 31-1/2"
Standard flat Camaro hood, has mounting bolts. 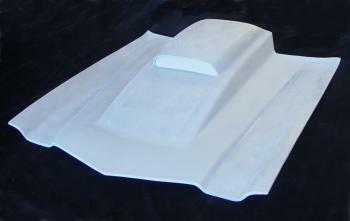 Can be used as a flat hood or the scoop of your choice can be easily glassed in. Full inner structure is well engineered, so it will not interfere with any scoop installation. Replica of the original chrome grill filler. This insert is not chrome, but since only a small front edge actually shows, it can be easily painted to match the color of the car, or painted silver if desired. Features full mounting flanges. Will work with #C130 or can be installed into original rubber grill collar. 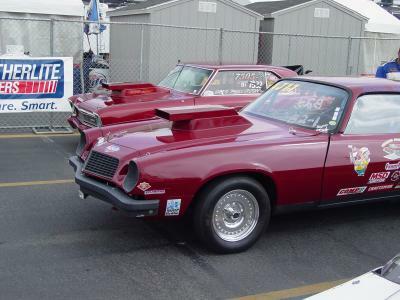 Race Style.....70-73 Front end full wrap around, less hood, lights and back of RS nose blanked off, RS style, Headlights can be mounted, bumperettes and nose piece built in NEW! 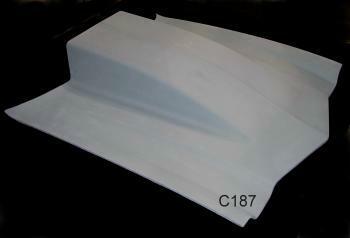 This C-702 includes SPECIAL 6" design front air dam NEW! These sturdy fenders can replace original steel fenders. Will reduce weight by approx. 50 lbs. Extra reinforcement is included along rear edge. Comes complete with all mounting flanges. Marker light holes are blanked off, but can be easily cut out if desired. 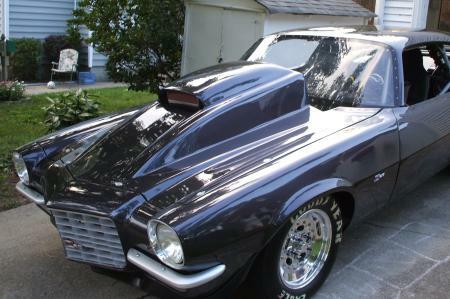 This hood is equipped with a snorkel scoop. Scoop base has been molded in as part of the hood. The snorkel top is supplied as a separate part that can be bolted or riveted on. The scoop base has a flange to aid in sealing the scoop to the carburetor. 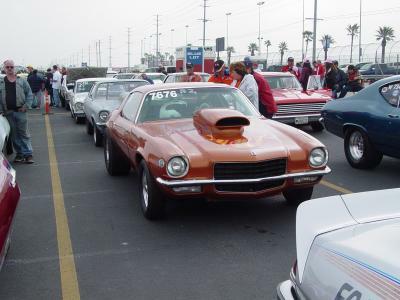 Light weight and durability makes this scoop appealing to the racers as well as the street enthusiast. This hood features more clearance than the C135 hood. Scoop is positioned directly over carburetor for maximum clearance. Rolled edges eliminates the need to grind to fit your car. Approx. 5 inch clearance at mid section 7 inch clearance at back. 9 inch cowl induction hood. Front sloped for reduced air drag. Available in race weight, bolt on rear and full bolt on. These inner fenders are designed to replace original steel wheel wells. 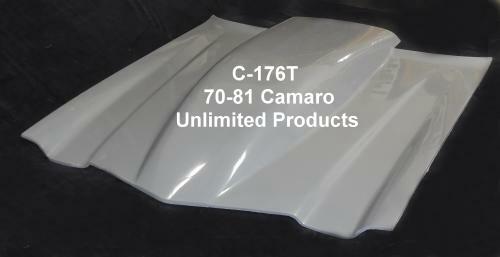 Made from high strength fiberglass which will never rust or deteriorate from weather or road conditions. Pre-drill required mounting holes in the part. Pre-mount the item to check for fit and trim if necessary. 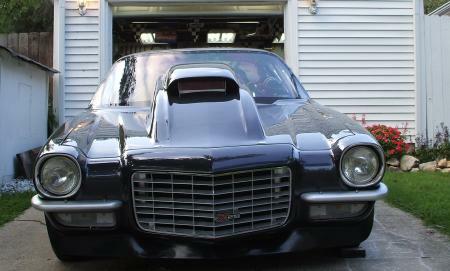 SS style front bumper. 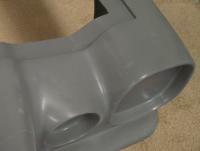 Full fiberglass construction makes this bumper suitable for painting. Strength and durability are built into each of Unlimited's bumpers. Designed for the pro-street look. 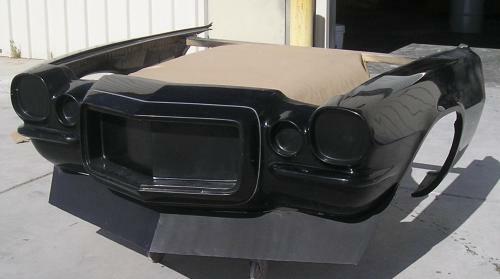 For 70-73 Camaro SS This lower panel replaces original steel valance. SS style. Does not use C130. It has flanges to bolt to the fenders, as well as the upper header panel. Also equipped with flanges for grill and turn signals. Approx. weight 6 lbs. 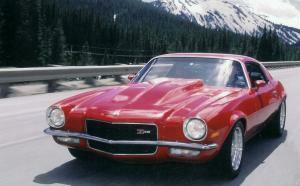 To convert a later model (78-81) to the 70-73 style, you must get parts C104, C105, C102R&L. To convert a 74-77 model, you only need the front nose parts (less fenders). 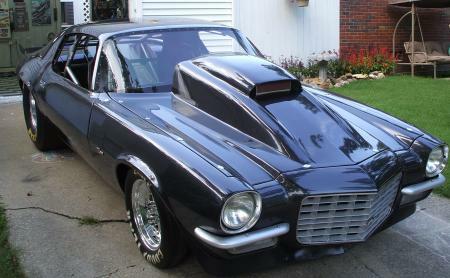 C-114 "RS" Front upper panel for 70-73 Camaro. C-115 "RS" Front lower panel for 70-73 Camaro. 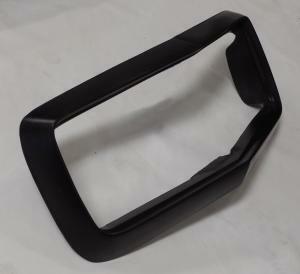 This bumper can be bolted to stock brackets. 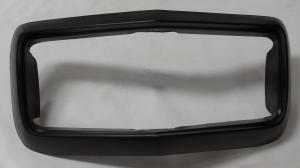 The black rubber guard is molded as part of the bumper. Light weight but strong enough to last. Can be painted to match car or just black. RS style front bumperettes R/L. These bolt to stock brackets. Feature full fiberglass construction for ease in painting. For use with C130 front nose piece. 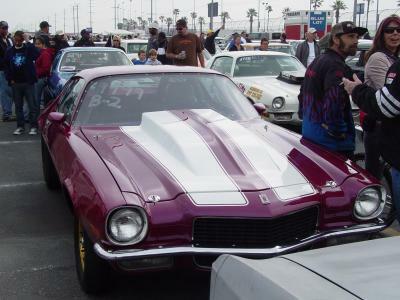 Rear bumper (fiberglass) 74-77 Camaro. Pre-drill required mounting holes in the part. 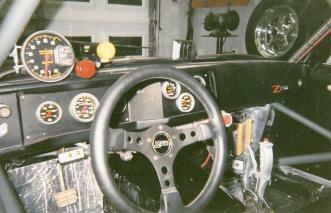 Pre-mount the item to check for fit and trim if necessary. Paint as if you were repainting your car....light sanding to scuff areas to ready for primer. Sand again to smooth primer and add patch putty if necessary. Paint with automotive type paint. If you use urethane paint of any kind or paints that require additive type hardeners, you will need a very good respirator type of face mask. Other paints will require use of standard paint face mask when spraying.